When your child is six months of age, it is time to introduce semi-solid foods to him or her. One of the easiest and most widely used options is Cerelac. This baby cereal can be made easily at home by just mixing in the necessary amount with warm water. But, Cerelac does not come in a variety of flavors and can become very boring for your child. That is why you need a flavored Cerelac Recipe that your child will enjoy. 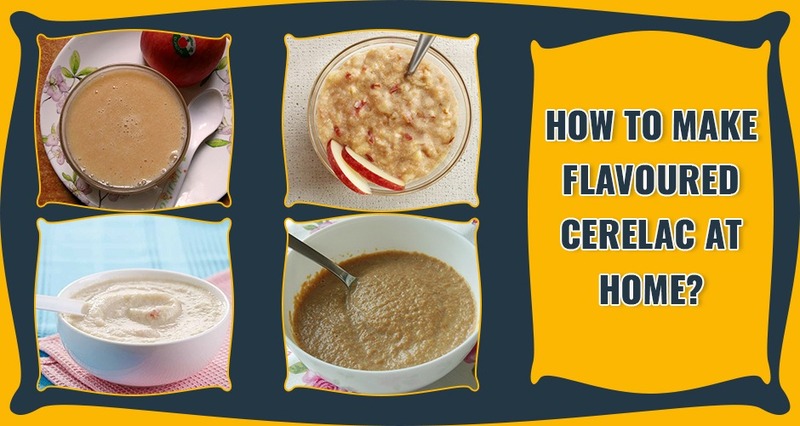 In this article, there are several recipes that will help you make flavored Cerelac at home. Homemade Flavored Cerelac Recipes are not just tasty but are extremely nutritious for your child as well. Boil the water and mix in 3 scoops of Cerelac in it. Stir continuously as you pour the water in to ensure that there are no lumps. Allow this mixture to cool down. In a blender, puree the boiled apples. Mix it in with the Cerelac. Add boiling water to three scoops of cereal and mix it well in a bowl till there are no lumps in it. In another bowl, mash the bananas and the jaggery together until you have a fine paste. Add this paste to the Cerelac that you have prepared. you can also blend all the ingredients in together. Boil 75 ml of water and add it to the cerelac. Mix it well to ensure that you do not have any lumps. To the remaining 25ml, add the orange juice to make a diluted concoction. Mix this in with the cereal. Allow it to cool and give it to your baby. prune juice that are too high in sugar. Also read: 5 Delicious Homemade Cerelac Recipes Your Kids Will Love! In a bowl, mix in the cerelac with boiled water. Make sure that you stir the mixture thoroughly so that there are no lumps. Allow this to cool down. Add the mango pulp and mix it till it is a smooth paste. You can add more water if you need to improve the consistency. Add the ghee just before you feed it to your baby. Using a pinch of cinnamon powder will make the flavor of this homemade flavored cerelac recipe better and more interesting for the little one. Prepare the Cerelac by mixing three scoops with boiling water. You need to make sure that it has no lumps. In a blender, blend the apple and the berries together to make a fine paste. Mix this paste in with the Cerelac that you have prepared. You can add a little more water if needed. Add the 3 scoops of cerelac into a bowl. Then mix in boiled water slowly as you keep stirring to prevent the formation of any lumps. In a blender, blend all the vegetables together to make a fine paste. Add this paste to the cerelac that you prepared. If it is too thick, you can also add some water to make it easy for the baby to eat. In a bowl, prepare the Cerelac by stirring in boiled water. Ensure that it is free from any lumps. In a pressure cooker, boil the moong daal with the necessary amount of water. Allow 8-10 whistles to ensure that the daal is soft. Then mix this daal with the Cerelac and allow it to cool. Before you serve it, add ghee to make it tastier. For toddlers who are 6 months of age, ensure that none of these flavored Cerelac Recipes contain any refined sugar or salt. You should also make sure that you introduce new foods with a gap of at least 3 days in between them. This ensures that the child does not have any allergies or can help you spot the allergies if any.